Company leaders always want to make sure that their employees work as a team to achieve complex goals quickly and efficiently. Teamwork, corporate relationships, job satisfaction, and other factors together create the organizational company culture. What is the difference between company culture and company climate? There is a difference between these two terms. Although they are interrelated, climate rather describes shared perceptions within the organization, while culture includes many other factors, like emotional components as well as beliefs, values, assumptions and other aspects that form and influence the set of standard behaviors within the organization. So, company culture is a deeper notion that encompasses a lot of complex aspects that drive a company. While company climate depends on the situation and can change pretty fast, organizational culture is something more stable and is based on relationship history. It is a system that every employee is required to follow. Organizational culture is what any leader should pay attention to. Regular assessments of organizational culture and values that dominate in the work environment are crucial to understanding the factors that contribute to or, on the contrary, negatively influence the way the company operates. 94% of executives and 88% of employees say organizational culture is crucial to the company’s success. Employees’ general ratings of the company’s qualities are 20% higher if the company has a strong organizational culture. 90% of employees that work in companies with a strong organizational culture are confident in the company’s leadership. It is obvious that assessing organizational culture is important for the success of a company. And yet, only 19% of executives said that their company had the right culture and 1 in 5 employees reported that their companies didn’t assess organizational culture at all. Organizational culture assessments are something that has to be done not just on a year-to-year basis, but as regularly as possible. There are several types of assessments that allow leaders to take a look at the organizational culture from different perspectives. Let’s take a look at these assessments and how to use them to measure your company’s organizational culture values. First, let’s concentrate on separate assessments that need to be done on a monthly basis to keep organizational culture measurements updated. Conducting the assessment of organizational culture starts with the measurement of goals and values as seen by the leadership of the company. 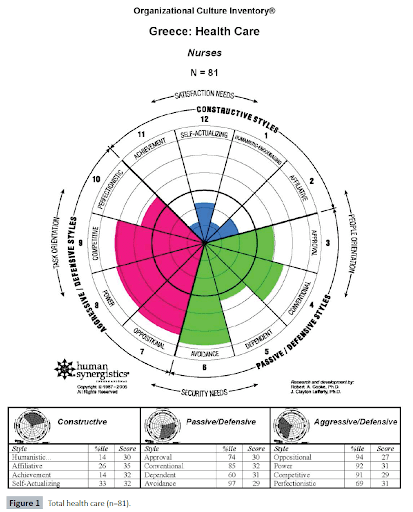 Business Needs Scorecard (BNS) is a type of organizational culture assessment that focuses on the current and desired culture organization values from the position of leadership. External Relations – this aspect includes values and behaviors that impact a company’s relations with outside factors like other market players, customers, etc. Evolution – this point includes values and behaviors that describe creativity, innovation and other factors needed for the company to grow. Culture – describes values and behaviors that impact trust, engagement, direction, communication, and supportive environment within the company. Contribution to society – values and behaviors that contribute to the company’s relationship with society. After measuring each of the six aspects, participants do an analysis of the features that need to be implemented to improve the current organizational culture values in order to reach the desired values. This assessment is important in order to understand organizational culture values from the perspective of the leadership. But BNS is a separate assessment and can only be put to use with other types of assessment, which are mentioned below. what needs to be done in order to improve the work environment. if the leadership provides the employee with regular feedback and encouragement. The answers to these questions provide you with the full data on employee insights concerning how they perceive organizational culture in your company. This survey also gives you the answers on what needs to be done in order to achieve the desired values and to improve the work environment to achieve company goals. This is another employee-oriented assessment that needs to be performed in order to measure the company’s organizational culture values. But what is a CTS diagram? A CTS (Common good, Transformation, Self-interest) diagram is a set of questions divided into three categories that let you know what your employees think of the cultural values in your company and what they think you should focus on. This assessment provides you with full information on how employees see the organizational culture and how they feel about the values that it brings along. 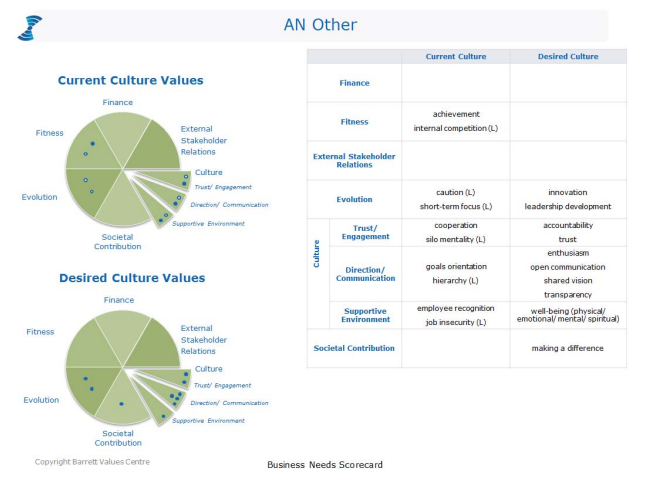 Together with the Business Needs Scorecard and Job Satisfaction Survey, a CTS diagram can help leaders and employees figure out the way how to achieve desired culture values, taking into considerations the ideas from both perspectives. As you can see, all the answers are measured according to three indexes: Constructive, Passive/Defensive and Aggressive/Defensive. The results show the aspects of organizational culture that workers are satisfied with and what needs to be focused on. This approach allows you to fully study organizational culture values without conducting several separate assessments. 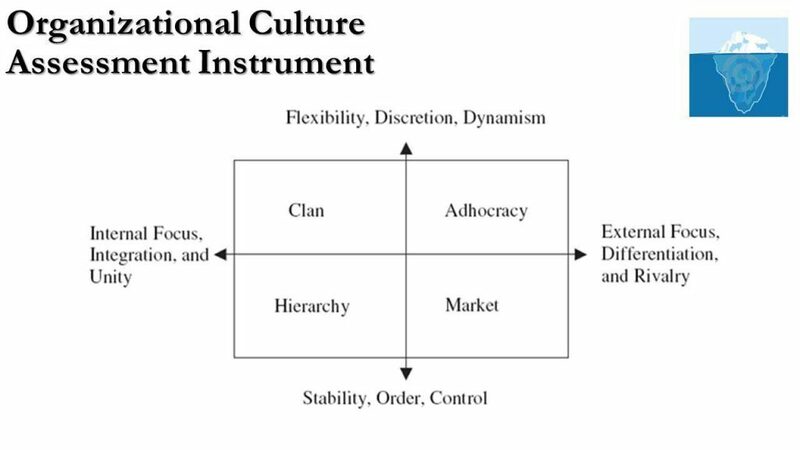 Organizational Culture Assessment Instrument (OCAI): this is one of the renowned methods of measuring organizational culture values. It focuses on the four basic competing values that dominate or don’t dominate in the organizational culture. These values correspond to the four types of organizational cultures. This method allows you to identify the type of organizational culture that dominates in your company and what needs to be done to achieve the desired organizational culture values. Assessing organizational culture values is a crucial step in bringing your company to success. It is reported that 48.4% of employees leave their jobs because of poor organizational culture. Thus, measuring your company’s organizational culture values on a regular basis will provide you with important data on how to retain a positive work environment and help you achieve success. 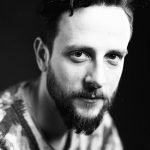 About the author: Ryan is a passionate writer who likes sharing his thoughts and experience with the readers. Currently, he works as a real estate agent at hu.Flatfy.com. He likes everything related to traveling and new countries. Ryan Pell, thanks so much for the post.Really thank you! Great.